The Park City Giving Guide highlights local nonprofit organizations that help make this such a great place to live, work, visit, and play. In bringing together donors, volunteers, nonprofits, and community members, Park City Community Foundation is helping create an enduring philanthropic community to benefit all the people of Park City. It’s easy to give back to Park City. 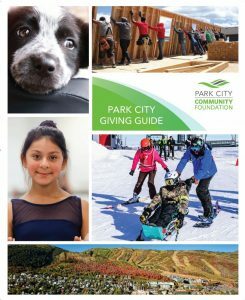 The Giving Guide features 45 nonprofits that serve the greater Park City area. You can give to the nonprofits by clicking on the “Give” button of your favorite nonprofit (you may choose as many as you wish; when you’re ready to check out, click the green donation cart button on the right.). You can also select your favorite areas of interest or give directly to Park City Community Foundation.